Volkswagen AG ADR (OTCMKTS: VWAGY) released its third quarter results and conducted a road show with Bernstein in London on November 6th, 2018. The company has increased the delivery to customers by 4.2% y-o-y in the first nine months, despite the challenges faced by the WLTP (Worldwide Harmonized Light Vehicle Test Procedure). Having burnt its hands in the dieselgate scandal, Volkswagen has succeeded to clean its dented image and deliver better results this year after paying a huge amount (more than $34 billion) in the dieselgate issue, and has generated sales revenue of approximately $198 billion in the first 9 months of 2018. We expect $264 billion in revenues from the German behemoth automaker in 2018. Further, the company initiatives to invest in Ford’s Argo AI to compete with e-mobility giant, Tesla, has boosted investor confidence in the company. The company has previously invested in Quantum Space, a battery-building unicorn, for the establishment of mass production of solid-state batteries by 2025 (Strategy 2025). Volkswagen also runs Hey-Car in Germany, a used car venture, in which Daimler AG has recently invested, depicting that electric-vehicles segment (currently a very small portion of the company’s portfolio) could generate billions in sales revenue for the company in the future. The company has recently announced its intention to convert three German factories to build electric cars as the automaker starts mass-producing electric cars by 2022 in these plants. We have a price estimate of $16.27 per share for the company, which is in line with the market price. View our interactive dashboard – What is Volkswagen’s Value Based on 2018 Results – and modify the key assumptions/expectations to arrive at a price estimate of your own. The Volkswagen Group expects the global economy to record slightly weaker growth in 2018 due to protectionist tendencies, turbulence in the financial markets, and structural deficits in individual countries further worsened by geopolitical tensions and conflicts. The company expects the full-year deliveries in 2018 to moderately surpass the previous year’s figure and sees a 5% growth in sales revenue and other business areas. Field sales revenue for Volkswagen Passenger Cars has risen by 7.3% to approximately $71 billion (assuming 1€ = $1.13) in the first nine months. However, in addition to the changeover to the WLTP emission standards, the company experienced higher distribution expenses resulting from scrapping premium, exchange rate effects and upfront expenditures for implementation of electric mobility, exacerbated by the diesel issue costs of around $1.8 billion. But higher vehicle sales and improved product costs were able to partially offset the above-mentioned factors. With an expected delivery of 4.2 million passenger vehicles in 2018 by Volkswagen, we expect $98 billion in revenues from the passenger vehicle division. Sales revenue of Audi stand at approximately $50 billion in the first nine months of 2018, a marginal increase from the figures a year ago but the company faced a decline in the operating profits, reflecting the impact of WLTP. The lower operating profits went downhill due to $0.9 billion due to diesel issue. We expect 1.4 million units sales of Audi, which also include Lamborghini and Ducati brands sales. Besides, the company sustained declining profits in Skoda due to cost optimization and improved price positioning but the margins for the brand were eventually pulled down by negative exchange rate and mix effects. In addition, the company posted losses in Bentley’s operating profit, largely due to delays in the start-up of new continental GT and costs associated with the delays and mix effects. Furthermore, Volkswagen’s commercial vehicles’ profits declined by 10% in the first nine months, outlining the challenges by WLTP and the unfavorable exchange rate trends in the WLTP implemented areas. 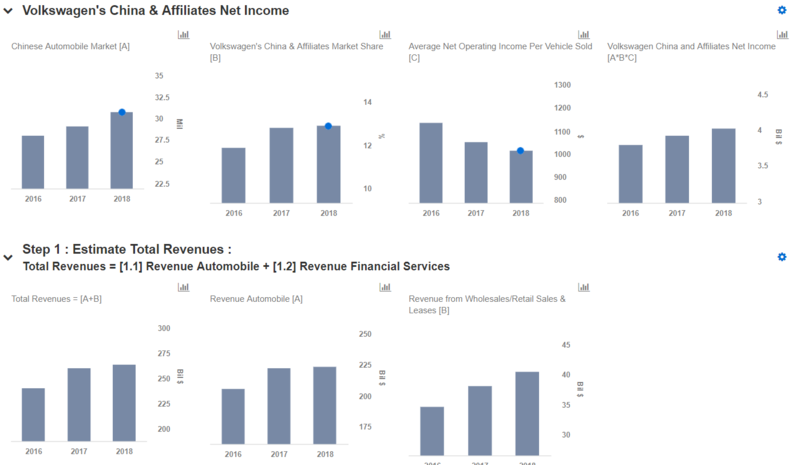 Be that as it may, the company was able to generate higher revenue and operating margins from its higher Porsche sales and due to positive mix effects. Sales revenue from the commercial vehicles (Scania and MAN commercial, MAN power engineering) was higher, backed by higher volumes, a favorable exchange rate trend, and improved financial services business. However, due to higher expenses due to restructuring activities in India, MAN’s commercial vehicles operating profit declined. Additionally, Volkswagen’s financial services profit climbed by 8.6% to approximately $2.2 billion in the first nine months of 2018, exhibiting a higher business growth potential in this division.